The Spokane Indians (4-3) face the Hillsboro Hops (5-2) in the finale of a five-game Northwest League series at Avista Stadium at 6:30 p.m. The Indians send RHP Hans Crouse (4-1, 2.45) against the Hops’ Ryan Weiss (0-0, 3.00). Last time out, Crouse hurled a gem. He struck out 12 over seven innings and allowed one run on six hits without issuing a walk. The quirky righty has struck out 41 over 33 innings in his seven starts while handing out just nine free passes and 21 hits. Weiss was the Diamondbacks’ fourth-round pick in this year’s MLB Draft. He’s been limited to a max of two innings in each of his six starts for Hillsboro and as such has tossed just nine innings so far. He has allowed three earned runs on eight hits and one walk, with one homer given up. 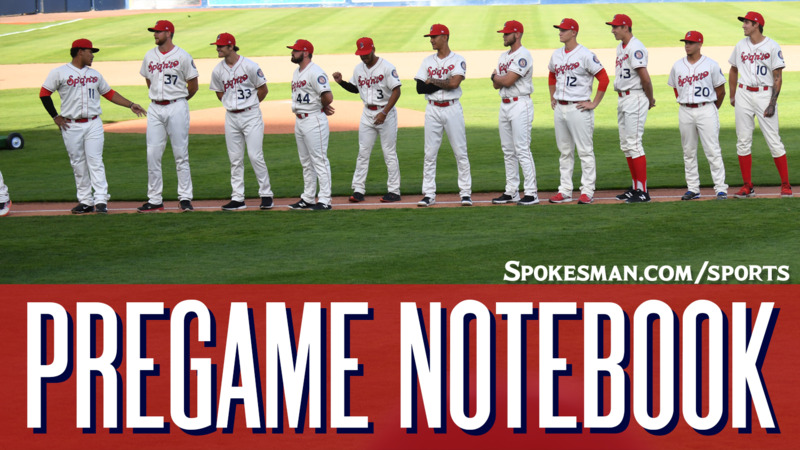 Hey now, you’re an All-Star: The Northwest League named five Spokane Indians – two starters and three reserves – to represent the league at the All-Star Game against the Pioneer League All-Stars on Aug. 7 in Grand Junction, Colorado. First baseman Curtis Terry – who leads the NWL in home runs and RBIs – and third baseman Diosbel Arias – who is second in batting average and first in on-base percentage – have been named starters. Lineup: 1) CF Starling Joseph, 2) 1B Hasuan Viera 3) 3B Diosbel Arias, 4) RF Jonah McReynolds, 5) SS Jax Biggers, 6) C Isaias Quiroz, 7) LF Tanner Gardner, 8) DH Scott Kapers, 9) 2B Tyler Depreta-Johnson. Player to watch: 3B Diosbel Arias. He has his average up to .362 after hitting .410 in the last 10 games with five multi-hit and three three-hit games in the span with 12 RBIs. Last night: William Gorman went 4 for 4 with two runs and two RBIs and the visiting Hops (5-2) scored twice in the ninth to top the Indians (4-3) 8-6. The Indians remained tied with Vancouver (4-3) atop the North Division. Promotion: Bark in the Park & Taco Tuesday. Bring your favorite canine companion to a game. Fans and dogs alike will receive the special group rate of $5 per ticket. Fans that bring their dogs will get to sit in a special pet-only section and all proceeds from the dog tickets will be given to the local animal shelters (SCRAPS, Spokanimal, and Humane Society). Stick around after the game and join the Puppy Parade on the field! Published: July 31, 2018, 4:15 p.m.